Do you feel overwhelmed by managing your money? Start making smart decisions with a personal financial plan. Are you struggling to plan for your financial goals? Do you feel frustrated and confused every time you think about your investments or retirement savings? While personal finances can be a challenge to learn, you can make smart, sound financial decisions with the right guidance. Personal finance expert Jason Silverberg is here to help. 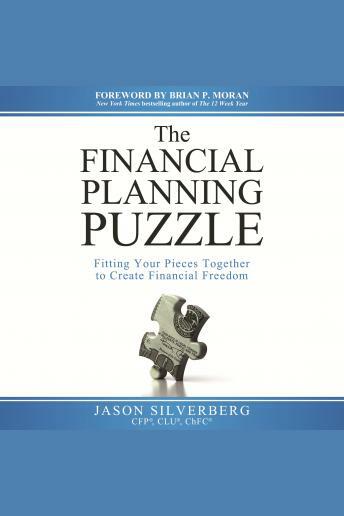 After guiding hundreds of his own clients toward their financial goals, Silverberg has condensed the best of his advice into his new book, The Financial Planning Puzzle. Whether you're a newlywed or a pre-retiree, a new parent or a divorcee, this book has advice you need to help you find the solution to your financial success. Achieve your version of the American Dream, and much, much more! This book also comes with fantastic bonuses, including a mini-course on the five critical steps to creating financial freedom. It's time to stop wasting time and money figuring out your financial life alone. If you're ready for a practical, simple, and enlightening personal finance book, then you'll love The Financial Planning Puzzle. Buy the book to start getting your finances in order today!